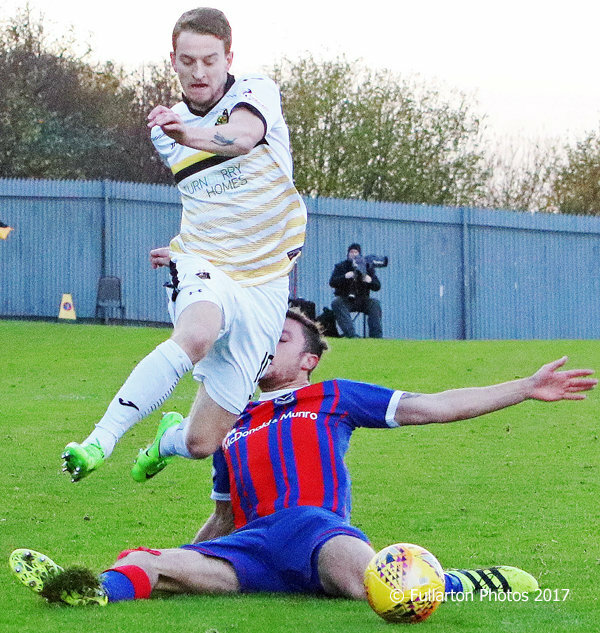 A NARROW but fairly convincing Dumbarton victory over Elgin City saw them progress to the fourth round of the William Hill Scottish Cup. A NARROW but fairly convincing Dumbarton victory over Elgin City saw them progress to the fourth round of the William Hill Scottish Cup in front of a 491 crowd at the YOUR Radio FM103 Stadium. Stevie Aitken's men were on top for most of the game and won 1-0, but as they could not add to that total there were worrying moments. The game started slowly, with Tom Walsh (pictured hurdling a defender) firing well over the bar a few minutes in, and keeper Scott Gallacher then making a fine stop to thwart the visitors. Dumbarton spurned several other chances as the half progressed, but finally went ahead through a touch of fortune on 23 minutes. Stuart Carswell saw his free kick take a deflection off the wall and wrong foot Elgin keeper Mark Waters before rolling into the net for 1-0 — his first goal in senior football. But Sons held firm and secured their place in the Scottish Cup fourth round draw.